Every day the possibility of the US and France leading military action against Syria edges closer. If it happens, it will mark another twist in a long and complex relationship. 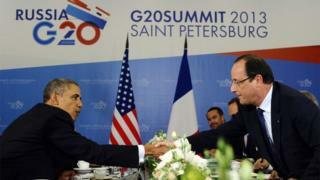 Barack Obama and Francois Hollande were the only two leaders at the G20 meeting in Moscow committed to using force against Syria. They make a pretty unexpected coalition of the willing, when you remember the American anti-French backlash over Iraq a decade ago, when french fries were off the menu and French wine down the plug-hole. But the image of the two presidents with fortunes entwined provides a neat historical symmetry. After all, if it wasn't for France then George Washington might today only be a name known to avid history students. In 1778, a fledgling nation called the United States made its first alliance, an event that many experts believe altered the course of its war of independence with Britain. In the late 1700s both countries used revolution to overthrow tyrants and establish democracy, or a "social contract" - a popular catchphrase of the day. America's social contract was based on the ideas of the English philosopher John Locke (left). Locke imagined a society that maximises individual freedom. While we all agree that it's necessary to give up some freedoms for the common good - like the "freedom" to steal or the "right" to kill - Americans try to preserve the individual's freedom to pursue happiness. For Locke, government is, at best, a necessary evil whose control over our lives should be kept to the minimum. The French social contract is different, requiring more individual compromises for the common good. When Simone fills her Renault at le pump, she pays more than twice for that gas than I do in America. And she does it willingly, knowing the built-in gas tax will be used to maintain roads, design the latest TGV bullet train, and pay city bus drivers. France was influenced by the social contract of philosopher Jean-Jacques Rousseau (right). Stressing that man is, by nature, not a rugged individualist but a social creature, he saw government as not merely a necessary evil, but as the embodiment of the communal will. The treaty signed by Francophile Benjamin Franklin in Paris meant France recognised the United States as a sovereign nation and was committed to the defence of its new ally. In effect, it brought France into the war against its long-standing enemy, Britain. "It was the first formal alliance for the US, this treaty of alliance and friendship and it probably made the difference between victory and defeat," says Gregory Urwin, a professor of history at Temple University in Philadelphia. "They were already providing covert aid, shipping weapons and munitions to Americans through front trading companies, but once they entered the war it changed the entire dynamic because Britain could no longer count on mastery of the sea." Every American is taught about the famous victory at Yorktown and the heroics of a dashing Frenchman, the Marquis de Lafayette, the young idealist who joined the Americans before his country had even entered the war. But it's another Frenchman, the Count of Rochambeau, who is the real French hero, says Urwin, because as commander of the French forces he had a decisive influence on Washington's triumph at Yorktown. The friendship between the two nations didn't last long. France expected American assistance in the wars that followed the French Revolution but Washington was reluctant to get drawn into a European conflict in the 1790s and chose neutrality, ignoring the terms of the treaty and sparking a quasi-war with France. But the mythology of Lafayette was set in stone in 1824 when the park adjoining the White House on its northern side was renamed Lafayette Square, in a city designed by another Frenchman, Pierre L'Enfant. Lafayette was further immortalised in World War I when, on American Independence Day in 1917, US troops paraded through Paris and stopped at his tomb, where at his request he was buried in soil brought from the US. The shouts of "Lafayette, we are here!" symbolised a country repaying its debt 140 years later. By then, the Statue of Liberty was already fast becoming one of New York City's most visible landmarks. It was a gift from "the French people" in 1886 that expressed the two countries' shared values. The second world war of the 20th Century offered another chance for American soldiers to be warmly welcomed on French soil. In Normandy, the Stars and Stripes can still be seen fluttering from homes on the anniversary of the D-Day landings. Supping lunchtime drinks in the Baltimore sunshine, yards from statues of Washington and Lafayette (above), Declan Shaughnessy echoed the thoughts of several present when he said the support of the French provided no consolation for critics of intervention like himself. "If Russia and China were leading the way, countries bigger than France, I might think differently." "I thank the French," says Chuck Merton, who supports a military strike. "I was never against the French over Iraq. The French are like us. They speak their own mind and follow their own beliefs, and I don't blame them. Just because we're the USA doesn't make us right all the time." But there persisted a belief among some Americans that the French were too ready to give up without a fight, a sentiment that entered popular culture in a Simpsons episode in 1995 that characterised the French as "cheese-eating surrender monkeys". This phrase was further popularised on the eve of the Iraq War, when France refused to support a US-led invasion, sparking a backlash against all things Gallic. The freedom fries episode came as a surprise to us, but we were vindicated by history so it doesn't really matter and the joke was on them. There was some sadness because we felt close to them. Generally speaking, the French are not anti-American. There has been a tradition of anti-Americanism among the left-leaning intelligentsia since the Second World War but it's not shared by the wider public. We've always been drawn to them culturally even though there have been some foreign policy differences. Charles de Gaulle wanted to stand independent from the US but French foreign policy has been largely Atlanticist for the last eight years. Syria won't have any bearing on how we feel about Americans - 68% of the French are opposed to military action and that has nothing to do with the US and everything to do with the way this policy has been conceived. The most memorable expression of this came when a restaurant in North Carolina, now closed, changed "french fries" to "freedom fries" on its menu. Others followed, including the canteen at the House of Representatives. The presidential plane Air Force One served "stuffed freedom toast topped with strawberries," instead of the usual French toast. France was added to a new "Axis of Weasel" with Germany, by satirist Scott Ott. After coining the phrase in his blog, it was on the front page of the New York Post two days later. But Ott doesn't believe a joint operation against Syria will mark a new love affair with France. On Iraq and on Syria, the French have been on the wrong side of the argument, he says. "So France will find itself against American public opinion again," he says, adding that he loves France but makes a distinction between its government and country. French fries were soon back on the menu but many Americans were embarrassed by the headlines it generated around the world. "Iraq was a ridiculous over-reaction to what could be considered a rational response by the French government and French people," says Steve Smith, an American who writes about France for Rick Steves' guidebooks. American tourism to France dropped, he says, either because Americans were angry with the French or embarrassed. Some that did visit pretended they were Canadian. "There was a huge drop in business. The number of tours to the country and guide books sold fell off the table, although it recovered years later." He thinks Americans love France but don't really understand the French. "There's such a fundamental difference in outlook. The French are driven not by how much money you make but what's on the menu for dinner tonight and what you are reading." Americans will ask early on what do you do for a living but the French won't, he says. And an American suspicion that French people are lazy exists because the French are more appreciative of leisure time. "They also expect more from government. The French are more willing to sacrifice the rights of the individual for the good of the community." The French played a leading role in Libya but it's the prospect of the two nations standing shoulder to shoulder on Syria that has ministers gushing. US Secretary of State John Kerry has talked fondly of the nation's "oldest ally" and spoke French as he made the case for military action while in Paris. One security analyst in Washington said: "We're all over here learning French, saying 'Vive la France!' That's the new thing." The rapprochement between the two leaders over Syria will matter to public perceptions, says Smith, because Americans love it when other people are on their side. "I feel it, listening to Hollande's words on the radio. And I think the average American is listening and will pay attention." The man who took french fries off the menu at the House of Representatives says it's ironic that the French are now leading the charge. "What a turnaround," says former Congressman Bob Ney, who maintains that what he did was a gesture to the troops in response to the heated anti-Americanism coming out of Paris at the time. And then, with a joking reference to the British, he adds: "Maybe we will have to ban fish and chips now."